I recently had the privilege of spending my Christmas holiday in the Big Apple. In a nutshell, the trip was just as I envisioned it to be. The streets were busy, the weather fluctuated considerably, shopping was plentiful, and the food choices were endless. Overall, my husband and I had a wonderful time. 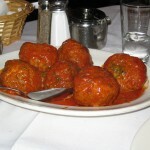 Carmine’s (Times Square) – The atmosphere of this family style restaurant is electric! Busy at almost all hours of the day, Carmine’s is an Italian style eatery located right in the heart of the Theatre District. The décor is eclectic Italian-American, showcasing pictures, holiday decorations and large wall mounted menus in every corner. My only regret is not having my family and friends there. The portions were served family style, leaving only the two of us to polish off a plate of raw littleneck clams, monstrous cheese stuffed ravioli with meat sauce, and a side order of meatballs (which turned out to be 6 tennis sized balls)! Top it off with a cappuccino and that set the bar for my very first meal in Manhattan! Many thanks to my lovely co-worker Marcie for an excellent recommendation. 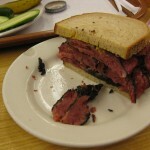 Kat’z Deli (Lower East Side) – Hands down the best pastrami sandwich I had ever eaten. The meat was moist and juicy, the ratio of lean meat to fat was ideal, pickles were delicious, what else can I say… I was too busy eating to even notice the endless photos of celebrities on the wall. A must when in NYC! Le Bernadin (Midtown West) – I have a weakness for celebrity chef restaurants, and ever since I began religiously watching Anthony Bourdain, I knew Eric Ripert’s seafood focused French restaurant was going to be one of my stops. We had the prix fixe dinner menu on Christmas Day, offering 4 courses. We both started with the kumamoto, 6 fresh oysters “en gelee” evolving from light to more complex flavors beginning with wasabi, yuzu, shiso, ponzu, dashi, and ending with kimchi. The flavors were playful, making these creamy oysters my favorite dish of the evening. Next came sea urchin risotto. I am a huge fan of fresh sea urchin, but was saddened as the risotto lacked in intensity and flavor. 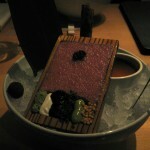 The evening redeemed itself as Eric Ripert’s infamous skate arrived for my entrée. Ponzu broth was poured table side a cleanly arranged plate of skate fillet, poached oysters and bok choy. The fish was enjoyable, cooking the meat perfectly moist, but not yet flaking apart. The broth however, became slightly salty as the course progressed. My husband had the Hiramasa, seared yellowtail king fish with a rich chardonnay veloute sauce, which was also cooked to perfection. We ended the meal of course with dessert. My theme was pear, which consisted of a cinnamon caramel parfait, liquid pear and sorbet. The liquid pear innovatively looked like an egg yolk, which then oozed out liquid when permeated. The parfait and sorbet was nothing memorable. Morimoto (Meat Packing District) – I watch a lot of Food Network, so I was quite excited to visit the infamous Iron Chef’s restaurant. We had the omakase, a 7 course tasting, but to avoid boring you with minute details, there was really only one course that lingers in my memory. The very first dish was a tuna tartar served with 7 condiments. It was the presentation that impressed me the most. The tuna was ever so finely chopped, and smoothed into what I could only describe as a miniature wooden wash board, resting on a bowl of ice. Just below the perfectly square sheet of tuna were 6 contrasting condiments ranging from white, to green, to brown to black. In the ice stood a metal spoon-like paddle, and a separate bowl of ponzu sauce on the side. We were told by the server to scrape the tuna using the paddle, dip in the sauce, and then with the neatly arranged condiments which included wasabi, mayonnaise, nori paste, avocado puree, chives, and rice crisps. Other than that, I was disappointed by the lack of clean flavors from the remaining dishes, especially the Maine lobster with Indian spices. I prefer my experience at Shibuya in MGM Grand Las Vegas. Candied Nuts (street vendors in various locations around Times Square and Central Park) – The cold weather brought out these delicious snacks for shoppers and sight seers to enjoy. Go for the mixed bag which includes peanuts, almonds, cashews and coconuts. The smell is irresistible, and the taste is even better. The buttery candy coating sticks well to the nut, leaving less “shells” at the bottom of your bag.